For those of you who don’t know the wilderness history, the preservation of French Pete drainage was a dramatic changing point in the wilderness movement. French Pete’s low elevation old growth forests were scheduled to be logged. 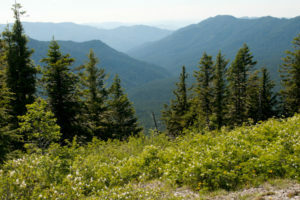 In 1937 the Forest Service established the 191,108 acre Three Sisters Primitive Area, and in 1938 added another 55620 acres that included French Pete and Ollalie Butte to the primitive area. Primitive areas were an administrative designation of the Forest Service implemented in part due to the efforts of Forest Service employees like Bob Marshall and Aldo Leopold. The idea was to protect the most scenic and wilderness landscapes under Forest Service Jurisdiction from any exploitation. However, since the “primitive area” concept was administrative, any district ranger or forest supervisor could also eliminate protections. The French Pete drainage was deleted from the primitive area in 1957. After the 1964 Wilderness Act passed Congress, the Three Sisters Wilderness was one of the “instant” wildernesses created with the legislation. However, the new wilderness did not include the French Pete drainage. With the passage of the Wildernes Act, the Forest Service was forced to do an inventory of all of its lands to determine if any additional areas should be added to the National Wilderness System. This inventory, known as Roadless Area Review Evaluation or RARE 1 “found” only 12.3 million acres that qualified for additional wilderness protection under the Wilderness Act. French Pete was not among them. The Forest Service, demonstrating its adherence to commodity production, had planned to log the valley’s trees. Meanwhile, beginning in the late 1960s, efforts to protect the French Pete drainage’s old growth forests was initiated by activists in Eugene. This included marches in the streets and other efforts that had been used in the Civil Rights and Anti-War campaigns. 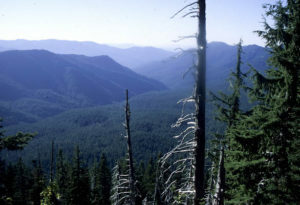 Due to resistance from Eugene conservationists and the help and intervention of Bob Packwood as well as at least one Willamette National Forest Forest Supervisor who was sympathetic to wilderness protection and delayed logging sales, the valley was eventually added on to the Three Sisters Wilderness in 1978 as part of the Endangered Wilderness Act. The addition of French Pete to the Three Sisters Wilderness was one of the first citizen initiatives to add lands to an existing wilderness setting the stage for many future additions to existing wilderness. There are lessons in this history for today’s collaborators. 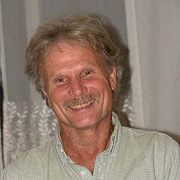 Had the local environmentalists worked with the loggers, ORV crowd (there were no mountain bikers back then) and Forest Service and other so-called “stakeholders”, most if not all of French Pete would now be a clear cut as the forest would have been divvied up between “stakeholders”. Back then there was no such thing as “collaboration” and the environmentalists held their ground against all odds. Think of how much more difficult it was then to fight the timber industry when the industry dominated Oregon’s economy. Yet today’s lame collaborators help the FS and timber industry log our forests using the same worn out excuses-it will burn if we don’t log it, and/or we need to share the land with all “stakeholders”. Every time I hike French Pete, I am so glad we didn’t have collaboration as the main strategy of wilderness advocacy organizations. Gorgeous – the history and the names and description of place. Great post, again!